Former Wales forward Ian Walsh says that Swansea City will miss Wilfried Bony, but the striker's £28m sale to Manchester City is good business. The Ivory Coast international, 26, joined Swansea for a club-record £12m from Vitesse Arnhem in 2013. The deal for Bony is £25m cash upfront with a further £3m in performance-related add-ons. "The profit that [manager] Garry Monk and Swansea City will make on Bony will be fantastic," said ex-Swan Walsh. "It's a shame really that he is going because he's been a fantastic player, he's a great goal-scorer, he leads the line and he's got a great attitude. MOTD3: Is Bony right for Man City? "So he has all the things that make him a top striker and Manchester City have got a great player on their hands now." 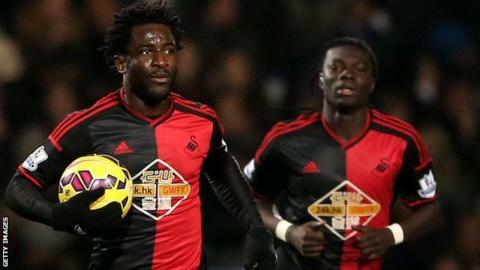 Bony was the Premier League's top scorer in 2014 with 20 goals and Walsh believes that the sum offered for the Ivorian made it almost impossible for Swansea to turn down. "When someone offers that sort of money, a club like Swansea they've seen it before and they'll see it again," Walsh added. "They bring in players, they've taken a gamble and that gamble has worked out for them financially." Walsh, who played 18 times for Wales and scored seven goals, believes that Bafetimbi Gomis might prove an able replacement up front for Monk's side. The France striker rescued a point for Swansea at home to West Ham on Saturday with a powerful header that Mark Noble could only put into his own net. "Okay, Swansea City are losing a top-class striker, but this is an opportunity now for Bafetimbi Gomis to step up to the plate," Walsh added. "He started off well on Saturday and Wilfried Bony might be a forgotten man within a couple of months, you never know."